Mid-Summer model mayhem: Euro heat or Atlantic cool? will this HIGH keep South dry? Update Sunday: EURO-HEAT is winning out briefly this week! Possible for 30C mid-week with thunderstorms. More later mini heat wave!? Forecasts for this week are swinging all over the place… from heat licking in from Europe over the SE and bringing attendant thunderstorms to a ridge of the Azores High building into the South and calming things down for a time, but keeping things in a westerly airflow and generally Atlantic and unsettled. So, after possibly very heavy rain / thunderstorms for us in SE on Monday / Tues what will it be for the rest of this week… Euro-heat and thunderstorms or Atlantic cool and breezy (i.e. a continuation of what we have now)? The forecast essentially depends on three things: the movement of the deep LOW shown hovering off the SW coast on the Sunday chart above, the strenght of the Azores High and the location of our good friend the jetstream (overhead at the moment, further south than it ought to be!). 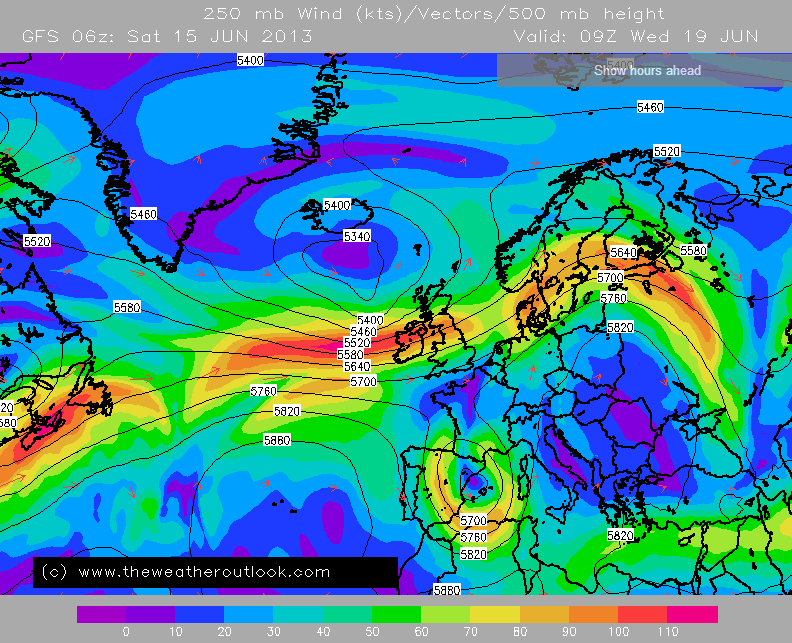 The LOW is forecast to form a trough over Spain and sink south over the Med producing showers there. This will leave a complex of fronts in N France with heavy rain moving north over the South of UK on Monday and Tuesday (heavy showers, poss thundery Monday pm). If the Mediterranean LOW yo-yos back to the UK later in the week it will bring a plume of heat with it but latest model runs show a ridge extending from the Azores HIGH shutting out any Euro-heat and keeping the UK in a westerly airflow pretty much under the jetstream… meaning continued unsettled weather especially in the North, for the coming week. Essentially this means the jetstream (below) stays in control of UK weather and brings a succession of LOWS with rain and wind and brief calm dry spells, especially in the south of the UK which fairs better. If the Azores HIGH can build into the South this will calm things down here for a longer period. This looks most likely at the moment from midweek onward until another LOW pressure comes in on Friday – the longest day.